As I do every day, probably like most, I woke up and immediately reached for my phone to check the latest goings on from the world of Twitter. I’ve got notifications for Ex (@ExWHUemployee) turned on because, even though I don’t support West Ham, I like to keep up to date with what’s happening at as many football clubs as possible. One tweet in particular caught my eye for all the wrong reasons and it was the one concerning James Collins, known to most as Ginge. Collins, 34, has played over 200 games for West Ham in two separate spells, with the latest being since he rejoined the club from Aston Villa back in the summer of 2012. 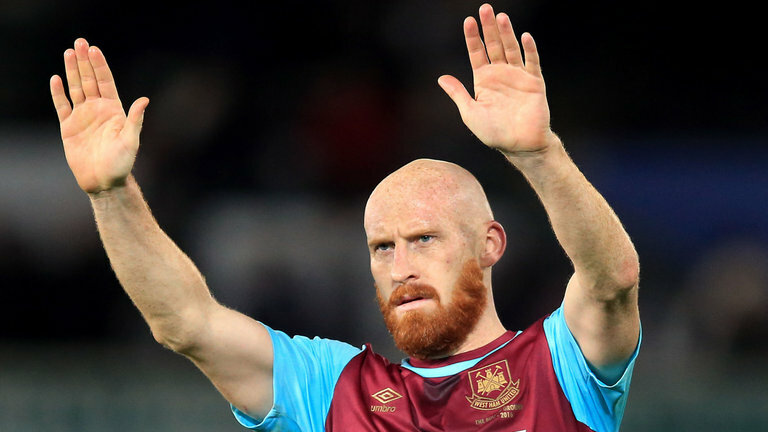 It’s a well-known fact, even to a non-West Ham fan like myself, that Ginge is West Ham through and through. I recall seeing Ex and others discussing when he recently watched an away game in with he fans, and then during the final game of the season there were chants of “sign him up” from the West Ham fans. So, waking up and seeing the news that Ginge had been informed his contract would not be renewed by the club via email was concerning, especially after around a decade of service to the club. While the club do not owe the player a new contract, while the player has had injury problems, what the club do owe a long serving player and a man who clearly loves West Ham is respect and the decency to discuss the matter with him face to face. Moving away from the Collins situation slightly, after enduring a poor campaign in the yes of many, West Ham did manage to finish the season with a couple of good wins against Everton and Leicester which saw them secure 13th place in the Premier League. While this may not have been the season most expected, especially the fans, it was a positive end to the campaign in some ways. I just want to point out where leaks are concerned, even though Ex releases “information” I really don’t think this applies to him. As someone who does hear things from inside football clubs myself, you learn what you can and can’t repeat very quickly. While there are people who hear bits hear and there and they immediately head to their social media accounts to post it, often for attention, when you have been in the ITK game a while, you learn to respect what you are told, and those telling you. This all really got me thinking about West Ham, and as an outsider maybe it’s a good place to judge as I have no emotional connection to the club. The club really does reek of unprofessionalism, and the main problem is that it starts at the very top. I remember writing an article for The West Ham Way a while ago and talking about how David Sullivan seemed to do a lot of talking, but not a lot of doing. I recall him mentioning their ability to sign big name strikers such as Alexandre Lacazette, but never delivering on it. There have also been cases where David Sullivan has made comments to the press which have not only made him look unprofessional, classless and disrespectful, but this then puts the club in a bad light by proxy. An example of this is when he discussed Jose Fonte and claimed his kids advised him not to sign the former Southampton centre half. A club’s hierarchy set the tone, and West Ham’s do a very good job of setting a negative one. It’s as if the club at times are looking to take steps forward, but they seem to always shoot themselves in the foot and find themselves two paces behind once again. The search is currently on for a new manager, and with Manuel Pellegrini set for talks, this should be seen as a positive time for West Ham as Pellegrini is a very good manager with an impressive record at numerous clubs in a raft of different countries. However, the Ginge situation in many ways could take the gloss off of his appointment, if he is indeed the man to replace the departed David Moyes. Ex has also hinted at further news that is due to break, which again doesn’t sound too good. West Ham ideally need the board to take a complete step back, they need to take stock of the situation and look to not only correct mistakes but prevent them reoccurring in the future too. While I’m neither board in, or board out, as this isn’t my football club, I do feel the pain of a poorly run football club with a penchant for shooting itself in the foot repeatedly. While owners and the board of a club are well within their rights to speak publicly I would urge those at West Ham just to think before they speak, or before they type columns in newspapers. Consider the consequences before it’s too late, and when it comes to transfers, less talk and more action, but leave it to the professionals.